The presence of excessive and nuisance weeds are the number one pond complaint in the summer. 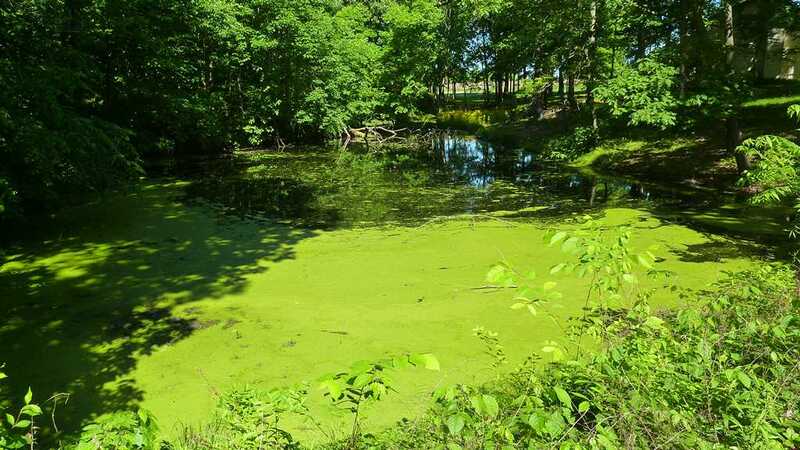 With warming temperatures, more direct sunlight and an increase in nutrients, ponds that are not properly managed will inevitably suffer this condition. Nevertheless, some weeds are necessary to maintain a healthy pond environment and are essential if fish are desired. Hence, pond plants need to be managed; not eliminated. Small ponds can be subdivided into two groups: lined ponds and unlined ponds, which tend to be larger. Lined ponds are relatively easy to maintain. Plants, which often cover more than 50 percent of the pond, are generally contained in pots. These pots are easily removed and replaced after the pond has been drained, cleaned and refilled. Unlined ponds contain a natural “soil” bottom and their maintenance is more complicated. Healthy and esthetically pleasing unlined ponds generally have 10 to 20 percent of the surface and bottom occupied with plants. This should include a narrow band of healthy, emerging plants along the shallow edges of the pond and exclude noxious plants such as filamentous algae (floating mats often referred to as “pond scum”). If more than 25 percent of the pond is occupied by weeds or if noxious weeds are present the following actions should be considered/taken depending on the size of the pond and your budget. These actions include reduction of nutrients, light penetration, water temperature and vegetation by mechanical, biological and, if necessary, chemical controls. 1.Control of nutrients in the watershed. a.) Nutrient sources such as trash piles containing organic wastes, leaking sewer lines or septic tanks should be corrected or eliminated. b.) Erosion, which and both contributes nutrients and decrease pond depth can be reduced by establishing vegetation, slope reduction, terracing, placement of rock, etc. c.) Lawn chemical runoff should be reduced by limiting application. d.) Presence of waterfowl, especially geese, should not be encouraged by feeding. 2. Mechanical controls: a.) Removal of weeds can be done by hand or use of hand tools such as rakes, cable drags, etc. Mechanical removal requires considerable personal commitment and is a continuous summer long activity. b.) Light penetration can be reduced by shading via use of black plastic covering and/or strategic planting of shrubs. c.) Temperatures and/or suitable conditions for plant growth can be reduced by deepening the shallow edges of the pond. d.) Weeds and nutrient sources removed from the pond should be placed in an area that does not drain into the pond. 3. Biological controls. Grass carp can be introduced to the pond for long term weed control if the pond is at least eight feet deep or if aerators are used. Note that grass carp preferentially feed and will only eat filamentous algae after other sources of food are depleted. 4. Chemical control. Algaecides and “shade” chemicals also known as aquatic dyes are available but should only be used as a last resort. 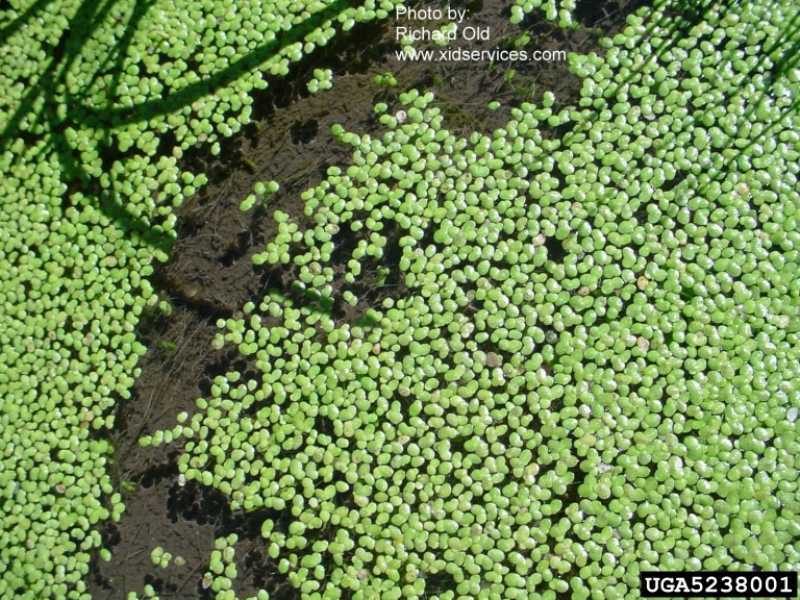 Some algaecides are species specific and require weed identification by a knowledgeable individual. Though algaecides such as copper sulphate are not toxic to fish when properly applied, they can cause fish kills by destroying food sources and by depleting oxygen levels because of rapid plant decay. Note that decaying plants are a nutrient source. 5. Pond renovation. Pond renovation may be the only available option for ponds in which weeds cover most of the pond. Unfortunately, this is usually the most expense option. It requires water drawdown and removal of nutrients once the pond bottom is sufficiently dry to remove the “black muck.” If this action is taken, it is recommended that the pond bottom be lined with a pond liner and blanketed with sand/gravel (4 to 6 inches) before refilling. More detailed information on pond management can be obtained from the Missouri Department of Conservation. Conservation staff at Missouri Parks containing ponds such as Busch Wildlife Area can be very helpful. Also, the US Department of Agriculture Handbook #590, “Ponds—Planning, Design, Construction” is useful. Strategies 1, 2, 3, 5, and 6 are strictly organic approaches.